Comcast and Brandywine Realty Trust created a mid-block crosswalk on Arch Street, between 17th and 18th Street in Philadelphia to make it safer for pedestrians to cross. As children, we’re repeatedly told by grown-ups to cross the street at the corner. When I was a kid, there was even a catchy TV jingle on this exact theme that aired between cartoons (and was covered, in ironic fashion, by They Might Be Giants in 2002). Called “In the Middle, In the Middle, In the Middle,” it was composed to discourage mid-block crossings and enforce a mobility hierarchy in which cars rule. The lyrics to that song still bounce around my head as I wander through the city. Yet, as an adult pedestrian, and someone who is usually in a hurry, I tend to do what I please, following the path that seems the fastest and most natural, even if it sometimes means taking more risk than I should. But what if the situation were reversed and it were safe for pedestrians to zigzag through town? In other words, what if we turned the hierarchy on its head and made it easy for people to cross in the middle, in the middle, in the middle by installing mid-block crosswalks? More than a half dozen of these crossings are actually in place, mainly in Center City and West Philadelphia. But, so far, most have been paid for by private building owners. That means the rest of the city, particularly its reviving commercial corridors, remains a danger zone. Ever since the automobile lobby demonized “jaywalking” in the 1920s in an effort to clear the roads for motorists, the city has acted as a surrogate parent, installing crosswalks exclusively at the corners of intersections and punishing scofflaws who dared violate the rigid system that prioritizes cars. But with the renewed interest in creating walkable cities, Philadelphia’s Streets Department has been promising to rebalance the relationships among people, cars, and bikes. While we’ve seen some notable safety improvements — raised intersections on Broad Street, traffic-calming bump-outs, and protected bike lanes — the city has been unusually slow to add the mid-block crosswalks. Penn installed a mid-block crosswalk on 34th Street to continue its internal Smith Walk, which connects the Palestra to the heart of the campus. Right now, the gold standard is the privately built mid-block crosswalk on 18th Street that connects Comcast’s two towers and allows employees to shuttle easily between them. Flashing lights attached to poles alert motorists to slow down as they approach the unusual crossing. The street on both sides of the walkway also has been paved with rough granite blocks, another traffic-calming measure. Instead of simply painting black-and-white stripes in the street, Comcast installed bricks treated with a glazed, reflective coating in those colors. As soon as the company started making plans for a second tower, it knew that a mid-block crosswalk would be essential, said John Gattuso, the Liberty Property Trust executive who oversaw the project. The plaza surrounding Comcast’s first tower included a walkway that went past the Arch Street Presbyterian Church and then terminated at 18th Street. 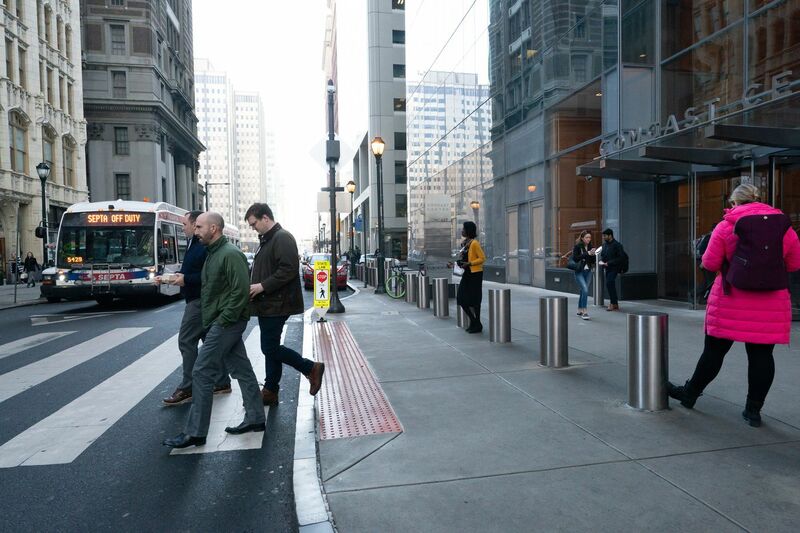 The new crosswalk, built with the city’s blessing, essentially extends that walkway to the door of the new Comcast Technology Center, enabling employees to safely navigate the company’s informal campus. Comcast had previously tested the concept on Arch Street with a mid-block crossing that links its tower to the old Bell Atlantic Tower, now owned by Brandywine Realty Trust. While the Arch Street version doesn’t have the same fancy paving as Comcast’s 18th Street crosswalk, it handles some 5,000 pedestrians an hour at peak times, according to the Streets Department’s Richard Montanez. It’s been nicknamed the “Wawa crossing” because of the convenience store on the north side. The two companies split the cost of installation, which ran about $350,000. While initially skeptical of mid-block crosswalks, Montanez said he has become a convert. There’s not much choice. Because people often feel that walking to a corner crosswalk is an unnecessary detour, they will simply wade into traffic, following what landscape architects call the “desire lines” to their destination. If enough people are taking shortcuts by crossing in the middle of the block, why not formalize those routes? There is no mid-block crosswalk on the 3200 block of Chestnut in the middle of Drexel's campus, so people wade into traffic. Montanez agrees but says the Streets Department budget for such improvements is limited. His office has been trying to rank locations with the most need. One of the most urgent is the 3200 block of Market Street, in the center of Drexel’s campus. With a gym on one side and a student center on the other, it’s not unusual to see clusters of pedestrians racing across the middle of Market Street. While the need is obvious, figuring out how to design the crossing on a multilane street like Market isn’t so simple. Traffic engineers believe that wide streets require a standard traffic light, rather than a simple sign with yellow flashers, like those Comcast used on 18th Street. Those traffic signals cost big bucks. Although Drexel has received $1 million state grant for the project, the crosswalk still needs more funding, a university spokesman said. The National Association of City Transportation Officials came up with this basic design for a mid-block crosswalk. At the University of Pennsylvania, officials simply took matters into their own hands. A few years ago, the university installed mid-block crossings on 33rd and 34th Streets. They serve Penn’s internal Smith walk, which connects its sports complex to the heart of the campus. The revamped Gallery shopping mall, which will open later this year as the Fashion District of Philadelphia, has just beefed up two existing mid-block crosswalks on Ninth and 10th Streets with raised structures the size of small hills. While it’s easy to justify the investment in mid-block crosswalks on college campuses and in dense shopping areas, where large numbers of pedestrians are constantly moving around, Philadelphia neighborhoods have had a harder time making their case to the city. Transit advocates from 5th Square, an advocacy group focused on urbanist issues, say improvements are desperately needed on Frankford Avenue in Fishtown, an increasingly busy pedestrian street that has been filling up with restaurants and shops. There is only a single crosswalk between Girard Avenue and Palmer Street, a stretch of three-quarters of a mile. After the University City District revamped the 40th Street trolley portal, the 5th Square advocates were dismayed to discover that no provision was made for a new crosswalk on the adjacent Woodland Avenue. The historic Woodlands cemetery has become a popular spot for joggers and dog-walkers, but you take your life in your hands trying to cross the avenue’s speedway. The district has just started talks with the Streets Department about installing a signalized crossing. The solution, though, is still years away. The same speedway situation exists on Second Street, across from the Piazza in Northern Liberties. According to Montanez, the original plan for the sprawling project included a raised crosswalk, but that element was never completed. The list of similarly dangerous crossings in other neighborhoods goes on and on, from Chinatown to Roosevelt Boulevard. Jonas Maciunas, a planning consultant for the Old City District, argues that if the city is short on funds, it should look for ways to bring down the costs of mid-block crosswalks. Not every treatment needs all the lights and bump-outs. “It shouldn’t come down to who can buy a good public realm and who can’t,” he argues. The Streets Department has embraced Old City’s plan for reconfiguring its stretch of Market Street, between Front and Fifth Streets, with a variety of traffic-calming measures, including mid-block crossings, and the district will likely be in charge of raising the funds for the project. But what happens on the rest of that wide street? “This idea that you cross streets at the corner intersection is a relatively new phenomenon, really a blink of an eye in the history of cities,” Maciunas said. “It was promulgated by AAA” and the automobile industry. It’s always been human nature to seek out the shortest path between Point A and Point B. If Philadelphia is going to be the walkable city we claim it is, then we have an obligation to make it safe, no matter where people insist on crossing the street.